Happy Monday All and hoping all had a Great Weekend. Can you believe, Summer is winding down and honestly I am so ready for it to be over and looking forward to Fall. However, I am still sewing for Summer... I know, it seems like an oxymoron. Of late, I have seen women sporting what I like to call swag tops in sheer fabric... it's so in tune with Summer, flowy & ethereal. Knew I had to have this top in my summer wardrobe, I mean really, how can I not, I was gobsmacked with inspiration. course, I went against the suggested fabric and used a black polyester chiffon that I purchased at 123 Fabrics. B5954 had the swag overlay and B6065 had the fit that I wanted. B5954 was not going to work as pictured on the envelope, clearly too much swing for my swag....lol. I cut B5954 front piece at the largest size (Med. ), placed B6065 on top and modified it for a closer fit. Of course, this morphing required some finagling in that I had to make sure that while using B6065 as my template for streamlining B5954, I had to keep measuring the pieces to make sure the front pieces overlapped enough. 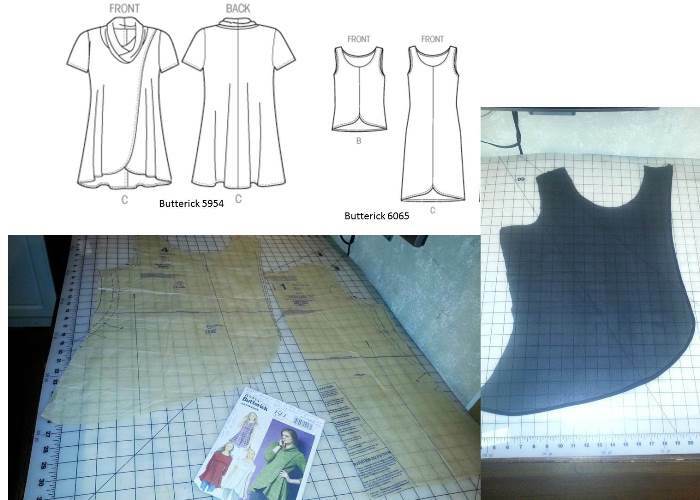 Repeated the process for the back pattern piece as well, which was a snap, twirl & twist easy part. With my finagling, I removed a lot of the swing from B5954 and shortened it too and totally omitted the cowl neck. All the seams were serged and seam allowances topstitch down. Once I'd measure like 5 times & cut, the assembling was smooth sailing. I looked at B5954 instructions, however, I went my own way in constructing it. Wherein the instructions have you attach the front pieces to the back at the shoulder seams then finish the front edges. I on the other hand focused on edge finishing the front edges first, then attaching the back at the shoulder seams. I am guessing the reason for attaching the fronts to the back at the shoulder seams first, is to finish the front edges and back hemline in one continuous flow. Finished the neckline by machine basting the two overlay front layers together and then used steam-a-seam around the whole neckline and folded in twice and final stitched. I will say it was a slow & tedious process, since I did not serge the raw edges of the neckline, I had to ensure that the raw edges were encased in the second fold over. With the top near completion, it was time to insert the sleeves, which gave me a run for my money. I added 1/4" to the sleeve cap, since I'd shaped B5954 armholes to B6065 and ended up having to shear off that same amount , then re-inserted, then rip out the stitching, and then run two rows of baste stitching to gather it and was only then able to insert the sleeves. Loft Striped Linen pants & Lela Rose T-Strap Sandals. Sheepishly, I must say that this top has been worn 3 times since I made it a week & half ago. Although this top is trendy, and has that here today and gone tomorrow factor, by modifying it, it works well with my suits and if I can pair a trendy top with my suits/or jackets its a win win situation..
OMG. Great look. You are on fire! Oooh! I love it! A great merging of styles! Making your own clothing must be a lot of fun; way beyond my capabilities! Your outfits are always so stylish, Sheila. You inspire me to try doing the same one day. Such a wonderful top! Love it! Another winner to add to your fabulous wardrobe. You are the master of sewing a great top and truly this is a great top! Love it!! You look great! When my sister sews she combines patterns and come up with some great looks. I can't wait to see what you come up with next. I love this top, I think I am going to copy you! Thank you Brandy. One day you will because you have the know how, it's evident in your home decor, it's just a matter of time. Thank you Lori and definitely do it. .. looking forward to your creation. I just love your style Sheila. This is awesome. 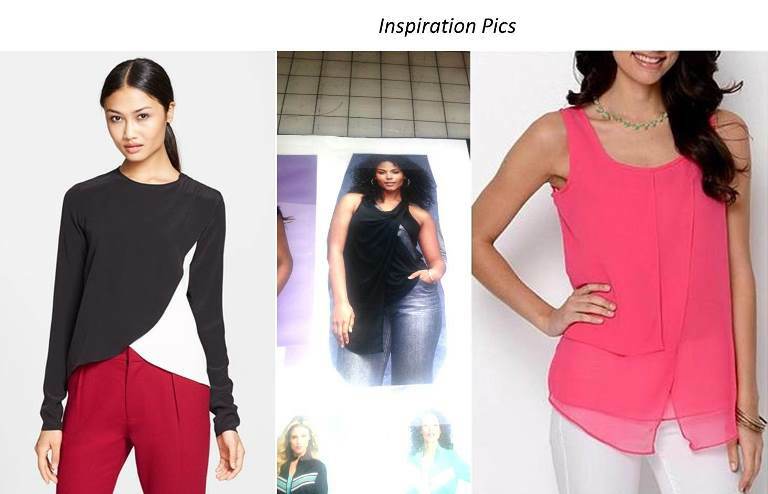 Butterick 5954 brought me to your page... love what you did to it. But I do want to show your picture of your sewing room to the other half.. just to show him that there are people out there who have AT LEAST one more sewing machine than I do. Thank you Laurie and feel free to share my sewing room pic. All your sewing projects are just exquisite!!! I love your work.